Submitted by Brian Sonenstein on Tue, 07/10/2012 - 11:53am. Congressman Ellison has some strong views about what is really afoot in the efforts around the country to adopt photo voter ID requirements, and he doesn’t like it. He explained why when he came to Drinking Liberally on Thursday July 5, 2012. Minneapolis Mayor R.T. Rybak Gets a DL Shirt! Submitted by Brian Sonenstein on Thu, 02/02/2012 - 6:16pm. 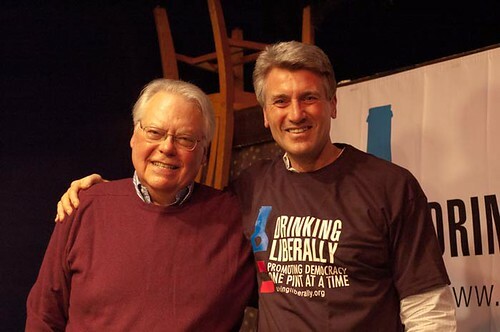 On January 26th, Steve Timmer, one of the hosts of Drinking Liberally Minneapolis (and St. Paul) presented Minneapolis Mayor R.T. Rybak with a DL T-shirt to recognize R.T.'s friendship with our chapter over the years. He has spoken to the group several times, and he helped us welcome visitors to Netroots Nation last summer with a special NN edition of Drinking Liberally that also featured Lizz Winstead and Thom Hartmann as guests. R.T. is currently the Vice Chair of the Democratic National Committee, and in that capacity made an appearance at the Sioux City Drinking Liberally chapter for a Republican debate watch before the Iowa caucuses. Submitted by Brian Sonenstein on Wed, 12/28/2011 - 5:42pm. Submitted by Brian Sonenstein on Fri, 11/18/2011 - 3:46pm. Waukesha is the hub of Conservative politics in Wisconsin, and Waukesha County Conservatives are not used to being challenged. For years, they’ve enjoyed their majority status, as Liberals stood silently by. Well, not anymore. We’re coming out of the woodwork in droves, thanks to Governor Scott Walker and his anti-middle class agenda. The Walker administration’s dastardly deeds, combined with the power of social media, have united Waukesha Progressives. Phil Scarr and I recently formed the first-ever Drinking Liberally Waukesha, and the result was nothing short of astonishing. We expected five to ten people to show up to the inaugural meeting of Drinking Liberally Waukesha at Sprizzo Gallery Café on November 7th. Even though we snagged Sly, a rock star radio host, as our first speaker, and despite having received a fair write-up in the Milwaukee Journal Sentinel the week prior, we didn’t have much hope for a high turnout. We were shocked when the room we had reserved filled up so quickly that we had to move the event downstairs in order to not violate fire code. Our group occupied the entire first floor of the restaurant! The following Saturday, November 12th, we held a “Special Session” of Drinking Liberally Waukesha. We really wanted Scott Wittkopf to speak to our group, as he had just published an expose on Waukesha GOP infrastructure, and how it drives the politics of the entire state. We figured, if Scott Walker could hold a “Special Session”, so could we. Phil and I prepared ourselves, and the room, for a sizeable crowd, even though it was a last-minute event. The room filled just to capacity, and every chair was taken. The crowd was a mix of people who attended the first event as well as some new faces. Two hours flew by as Scott Wittkopf discussed his ‘Blame Waukesha’ piece in detail while entertaining questions from the group. Many people approached us afterward to say they had a great time, and to thank us for starting the Waukesha chapter of Drinking Liberally. Word is spreading quickly throughout Waukesha County about Drinking Liberally Waukesha, and our email subscriber list is growing at a rapid clip. Our next meeting is on December 5th at Sprizzo, with Mike McCabe of the Wisconsin Democracy Campaign as our speaker. A few days ago in downtown Waukesha, I ran into a woman who had attended the first two Drinking Liberally meetings. She proudly wore her Drinking Liberally button on her jacket, and giddily informed me that her tiny button had been spotted by someone who had also attended the events. She was clearly happy to have found a little blue in a sea of red. “You got any more of these?”, she asked, referring to the buttons. Looks like we’re going to need them. Submitted by Brian Sonenstein on Fri, 10/28/2011 - 2:04pm. When you think of the great wine regions of the world, do Michigan, Maryland, or South Dakota come to mind? Probably not. What about eco-friendly wineries? You don’t have to be in a sommelier certificate program or online graduate course to learn that many wines are ecologically sound. Many wine lovers have a difficult time with keeping their consumption of the good stuff sustainable—cork trees are limited and many wines are shipped from faraway places. Believe it or not, there are wineries around the U.S. that are not only local, but also created as sustainably as possible. When it comes to being environmentally conscientious, even larger wineries are getting on board with the sustainable movement by constructing new buildings out of materials like straw bales. Others are showing they care about the planet with no bottle and no cork wines. As the green movement gains ethos and popularity, more wineries and wine buyers are looking for a multitude of elements of sustainable wine. Having multiple pieces of what it takes to make sustainable wine is what makes some of America's smallest vineyards amazing. Although most sustainable vineyards are in California, there are definitely plenty of eco-friendly wineries in unexpected places outside of the usual Napa and West Coast green wine scene. In the hills of Michigan, for example, there is one winery that it is trying to do everything a customer looking for organic wine could want. Above and beyond, a visit to the Pleasantview Vineyards and Winery in Harbor Springs, Michigan is worth the trip. Looking out for migraine sufferers, they guarantee they are selling a low-sulfite product. On top of all of the chemical free vineyards they harvest grapes from, there are also other sustainable agricultural techniques in place. For example, owners at this vineyard hand tend, hand harvest, and hand press their wines. They also ensure that their labels are completely green. When visiting Keuka Lake in New York’s Finger Lakes, be sure to stop by a local vineyard that has been making green wine since 1977. Not only is this place worthy of titling your glass, it is also a popular tourist and wedding destination. There are 20 wine varieties at Heron Hill with green techniques at work. While they are not certified as organic, they do participate in the New York State Vine Balance sustainable agriculture initiative. They also keep up a sustainable appearance by donating $2 from some of their labels to the rare Seneca White Deer foundation. If there is one place in the country where Amish work ethic meets great tasting green wines, it is in Pennsylvania. While browsing the website for the Crossing Vineyards and Winery in Washington Crossing, you will soon realize that they aren't taking the slow approach to the green wine revolution. They use solar energy in the winery and grow grapes with sustainable methods in their vineyard. By the time you get to the tasting room, every part of your tour will reveal how the computerized agriculture program is a state of the art maker of wine luxury. Low impact viticulture is in full effect at the McRitchie Winery and Ciderworks in Thurmond, North Carolina. As part of their tour, you will learn that in the world of vineyards you hear a lot about inputs. Inputs include all the raw materials that go into wine production, and can include organic products grown with high-sulfur fertilizers. Using carefully crafted techniques, McRitchie Winery shows that sustainable inputs are the way to craft the best small batch wines. Out in the middle of Hill City, South Dakota is a surprising and sustainable vineyard that stands out. Far from a label no one has heard of, this is the home of one of the few wines that won the 2010 San Francisco Chronicle Wine Competition against the staunch nearby Napa Valley contenders. Like the California wine industry, Prairie Berry Winery hopes to reflect all of the values of even their most progressive customers on the sustainability front, and is owned by two former engineers who took sustainability into consideration when designing and constructing the heating and cooling system for the winery. Although the fact that they do ship a small amount grapes from the West coast where the climate is better for grape production may be a strike against them on the ecology front, the majority of their wine ingredients come from local produce and berries that can grow in the harsh and arid climate, such as rhubarb and crabapples. Prairie Berry Winery sustainable packaging techniques mean using recycled heating and cooling systems. Topped off with Stelvin screw caps instead of corks, the berry and local fruit wines out of Prairie Berry are definitely ahead of the game in unique taste and sustainable practices for the Midwest, and on a national scale. Are you starting to notice that a lot of sustainable wineries are popping up in unexpected places? If you are curious about this trend, one look at the US Department of Agriculture (USDA) website might help you understand the rise in green wines. With over twenty informative and up to date links, the government is showing America that eco-friendly wineries work for the future of the United States’ growing wine production. The information on sustainable viticulture could be the inspiration to start a vineyard of your own or understand more about the green wine tours you want to take. Submitted by Brian Sonenstein on Tue, 05/03/2011 - 1:11pm. We just wanted to let everyone know about some great work being done by our Spartanburg, SC Drinking Liberally chapter. They are gathering funds to send to Japan's Tohoku Rainbows Project, which benefits children affected by the earthquake. Read Al's letter to Spartanburg chapter members and consider lending a hand! After reading the DL Check-in Summary posted by Justin, Katrina and the gang, I proposed to our DL group that we support the Tohoku Rainbows Project. This endeavor is headed up by Lauren Shannon, Co-Host of DL Tokyo. Information on her project can be found on your check-in summary, but basically what she is doing is distributing coloring books and crayons to displaced children in her country. Our members felt this to be an excellent way to send our love to Japan and help the children get through this terrible time. At our gathering last week, we raised 5000.00 yen ($61.00) and sent it on to Lauren. It was a "feel good" time for all of us. We in Spartanburg are asking that you consider Lauren's project and contribute what you can to help this grow. Read the information about what she has done, and is doing now, I think you'll be impressed. She is definitely one with a liberal heart. Get Your Tickets NOW for Living Liberally's 5th Annual Spring Celebration & Fundraiser! Submitted by Brian Sonenstein on Wed, 04/27/2011 - 1:47pm. It’s time for Living Liberally’s 5th Annual Spring Celebration and Fundraiser! On Saturday, May 7th 2011, we’ll be getting together from 7-11pm to catch up, discuss our future and honor the hard work of our fellow progressives. Color of Change is one of the fastest growing progressive advocacy organizations on the Left, and has recently scored a huge victory in their long campaign to take Glenn Beck off of TV. By circulating petitions, contacting advertisers and spreading the word about Beck’s hateful conspiracy theories and diatribes, Color of Change was largely responsible for Beck’s decline in ratings and eventual departure from FOX. Tickets start at $100, but if you register now, you can take advantage of our recession special -- two tickets for $150 total! So grab a pal and join us for some liberal libations as we celebrate our work together over the past year. Join us for the 2011 Living Liberally Spring Fundraiser and Celebration! Click here to register today. Submitted by Brian Sonenstein on Tue, 11/30/2010 - 2:47pm. Submitted by Brian Sonenstein on Tue, 11/30/2010 - 11:25am. While writing cover letters to try and end my five-month long spell of unemployment, I was also reading a book that discussed Depression-era unemployment protests, which were apparently pretty kickin' and often involved singing. Since I enjoy writing rhyming songs, I thought it would be fun to sing songs about unemployment rates, my belief that we need more government investment to create jobs, and extending unemployment benefits, to the tune of Christmas and Hannukah songs. Jobs for all, Jobs for all! Give us a jobless recovery, we'll put you in the snow. Give us a jobless recovery, we'll put you in the snow! Why did 8.2 million of you go away? Submitted by Brian Sonenstein on Fri, 11/12/2010 - 6:36pm. Veterans Day, which Americans celebrate on November 11, was originally called Armistice Day, to commemorate the cessation of fighting in the Great War of 1914-1918. In the United States, the idea that this was “the war to end all wars,” (a phrase coined by H.G. Wells in a pamphlet of that name and echoed by Woodrow Wilson with equal earnestness) was challenged by an outspoken and persecuted peace movement, including poor farmers and black Americans conscripted at disproportionate rates. Most Americans may have accepted the justification at the war's start, but by the war's end, with a U.S. body count of 117,000 and double that in serious injuries (and 37 million casualties overall on both sides, 16 million deaths and 21 million wounded), the signing of the Armistice by Allies and Germans at the 11th hour of the 11th day of the 11th month of 1918 was met with celebration that it might mean a true “end of war.” In 1919, a year later, Armistice Day was established to celebrate "the resumption by the people of the United States of peaceful relations with other nations, which we hope may never again be severed." After World War II and the Korean War, and the start of a heated Cold War, it was clear to the government that an armistice and peace were not in sync with the times. In 1954, Congress changed the name of the November 11 holiday to Veterans Day, exchanging peace for celebrating patriotic valor, and the ultimate sacrifice of life, limb and health in battling for one's country. 1) It took almost 50 years for the government to acknowledge the suffering of more than 200,000 U.S. veterans exposed to the herbicide Agent Orange, which the U.S. military used for a decade to defoliate forests and destroy food sources in Vietnam. Despite higher incidences of cancer, neurological, digestive, skin, lung and heart disorders along with miscarriages and birth defects, the DoD denied any linkage of exposure and disease, and disability claims, which veterans initiated in 1977 were mostly denied. By 1993 only 400 veterans exposed to Agent Orange had been granted some compensation. Class action suits against companies like Monsanto and Dow Chemical settled out of court for small amounts. After much advocacy by veterans and their supporters, the 1991 Agent Orange Act was passed, allowing the VA to declare specific conditions "presumptive" to Agent Orange. This summer the list was expanded to include B cell leukemias, such as hairy cell leukemia, Parkinson’s disease and ischemic heart disease. Still, after five decades, compensation is small with the vast majority of awards at 20 percent or $243 montly. 2) Almost a third of the 700,000 veterans of the 1991 Gulf War suffer from a profound physiological disorder called Gulf War Illness (formerly Gulf War Syndrome). For almost 20 years, the DoD and VA insisted that psychological stress alone was the cause of the fatigue, mood disorders, cognition and memory problems, and disorders of every physical system as well as birth defects of veterans' children. To date, some 11,000 veterans have died from the illness, and most survivors continue to suffer chronic symptoms. In 2008, the Gulf War Research Advisory Committee (RAC) reported what veterans have known too well—that wartime toxins, not stress, caused profound physical illness in almost 300,000 veterans of Desert Storm. RAC identified in particular a class of neurotoxins found in experimental anti-nerve gas pills that troops were forced to take upon threat of court martial, pesticides and sarin gas, which plumed for hundreds of miles when Iraq munition storage facilities known to contain nerve gas were exploded. RAC did not rule out vaccines or depleted uranium, pioneered during the Gulf War for its ability to penetrate most anything. Yet the RAC report's recommendations for immediate interventions and programs have not been followed, but rather remain the subject of further study by the Institute of Medicine. 3) Veterans of ongoing fighting in Iraq and Afghanistan have suffered a variety of physical traumas beyond the widespread maiming and loss of limbs. Last year, the DoD warned that as many as 20 percent of veterans (360,000) may have suffered traumatic brain injury from IED blasts. Blast injuries generally do not result in skull fractures or loss of consciousness, yet the Institute of Medicine has reported that these traumatic brain injuries may cause diffuse brain bleeding and result in PTSD and problems with mood, concentration, memory, pain, balance, hearing and vision. In addition, veterans have suffered multiple toxic exposures, including contaminated water, and dioxin and other carcinogenic compounds from the widespread use of burn pits instead of incinerators in Iraq and Afghanistan. Everything from refrigerators to trucks to body parts has been reported burning in the vast pits, which spew black smoke for miles and cause the black phlegm known as “Iraq crud.” Several class action suits have been filed against contractors like KBR on behalf of veterans sickened by toxic exposure. 4) On any given night, more than 200,000 veterans are homeless, and 1.5 million veterans are considered at risk for homelessness. Because of lack of work, support networks and substandard housing, veterans without homes have served in every war with surviving populations--World War II, the Korean War, the Cold War, Vietnam, Grenada, Panama, Lebanon, the 1991 Gulf War, Afghanistan and Iraq. Vietnam veterans have long comprised the largest portion of the homeless veteran population, but veterans of the current wars in Iraq and Afghanistan have become homeless much sooner than veterans of the Vietnam War did. PTSD and traumatic brain injury (TBI) can cause severe psychiatric symptoms from mood disorders to depression, aggressive and dangerous behaviors, substance abuse and alcoholism. In addition to psychiatric, neurological and physical injury, multiple deployments, the high cost of housing, reduced job opportunities, and low wages endanger family stability, employability and maintaining a steady residence. 5) The population of homeless women has skyrocketed from 5 to 20 percent over the last decade as more women are deployed into battle. Women veterans are two to four times more likely than non-veteran women to be homeless. Approximately 40 percent of homeless female veterans of today's wars report being sexually assaulted by male soldiers while in service, with sexual abuse being a major risk factor for homeless according to the VA Homeless Programs director. Fifty-six percent of all homeless veterans are African American or Hispanic, despite being only 12.8 percent and 15.4 percent of the population, respectively. 6) Over a half million Iraq and Afghanistan veterans are patients in the VA system. Thousands more wait as much as a year for VA treatment for serious ailments including traumatic brain injury. Forty-eight percent (243,685) are mental health patients and 28 percent (143,530) are being treated for PTSD. A recent internal VA memo revealed systematic gaming of the VA application process, whereby bureaucrats at facilities seek to improve access data by denying treatment. 7) Every day, five U.S. soldiers attempt suicide, a 500 percent increase since 2001. Every day 18 U.S. veterans attempt suicide, more than four times the national average. Of the 30,000 suicides each year in the U.S., 20 percent are committed by veterans, though veterans make up only 7.6 percent of the population. Female veteran suicide is rising at a rate higher than male veteran suicides. 8) The number of U.S. service men and women killed in Afghanistan has doubled in the first quarter of 2010, compared to the same quarter last year. In the first two months of 2010, injuries tripled. 9) Estimates of civilian deaths from violence in Iraq alone range from a conservative 105,000 (Iraq Body Count project) to over 1.2 million (UK pollster Opinion Research Business), with estimates by Johns Hopkins at 655,000. More than 125,000 civilians have been injured in Iraq and 4 million displaced, with civilian death and injury in 2010 rising each month. By most estimates, tens of thousands of Afghan civilians have been killed or injured since the 2001 invasion; over 200,00 have been internally displaced; and over two million have become refugees, with civilian deaths and injuries rising dramatically in 2010. 10) U.S. veterans live with these horrific realities daily. Many are acutely aware as they suffer, of the suffering they have inflicted on others. Nora Eisenberg is the director of the City University of New York's fellowship program for emerging scholars. Her writing has appeared in the Nation, Guardian UK, V illage Voice, the Los Angeles Times and Tikkun. Her most recent novel, 'When You Come Home' (Curbstone, 2009), explores the the 1991 Gulf War and Gulf War illness.